I love particularly this salad a lot. But never made it before at home. During my stay in US, it was a must whenever I went to McDonald's. I loved their ceasar salad. Few days back, I was craving for this salad and thought to make it at home. 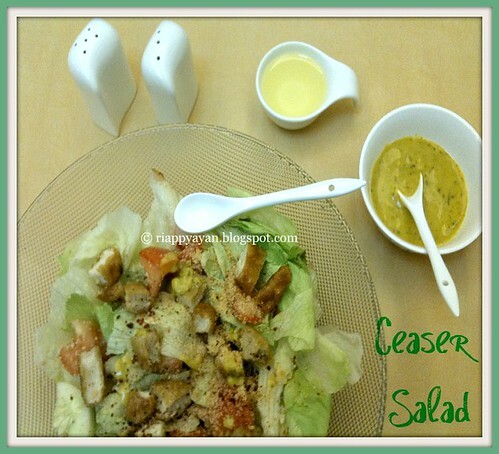 A Caesar salad was invented by an Italian restaurateur Ceasar Cardini. 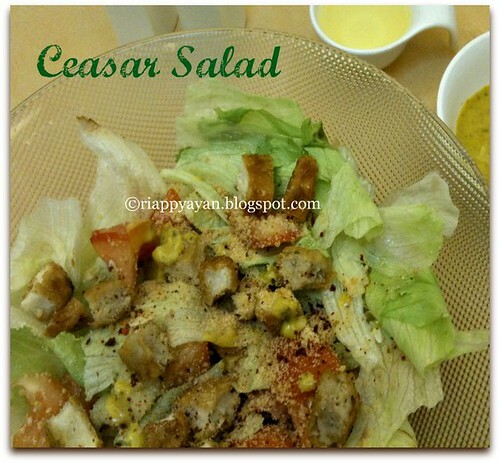 It is a salad of romaine lettuce and croutons dressed with parmesan cheese, lemon juice, olive oil, anchovies(Anchovies are a small, shiny, silver fish), Worcestershire sauce and black pepper. There are limitless variations, but the most common ingredients are lettuce, croutons, grilled chicken pieces, seafood and more importantly cheese. Now, more than a dozen varieties of dressing are available today. Nobody knows which one is original, but I'll share how I made it mine, which includes mustard, lemon juice, vinegar, garlic, Worcestershire sauce, salt, black pepper and olive oil. This dressing is very refreshing and mustard along with garlic and lemon juice go very well together. Croutons(a small piece of rebaked bread) : 9-10 pcs. Olive oil : 2 tblsp. Throw first few(2-3) layers of leaves from lettuce head, if they are not fresh. Then take few layers of lettuce leaves and chop in big pieces. Cut tomatoes and cucumber in cubes. You can also add corn or carrot. Lightly fry chicken nuggets or cooked chicken breasts in oil and add in the serving bowl along with lettuce, cucumber and tomatoes. To make dressing, in a bowl, add all the ingredients and mix well. Just before serving, add croutons and parmesan cheese to the serving bowl and add dressing sparingly, gently tossing salad until the leaves are barely coated. The salad looks quite tempting! Yum! I love this salad, simple, falvorful and delicious. 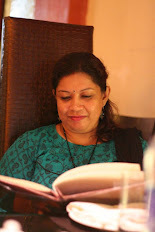 Love this crunchy salad, my fav,its been a long i had them,tempting me a lot..